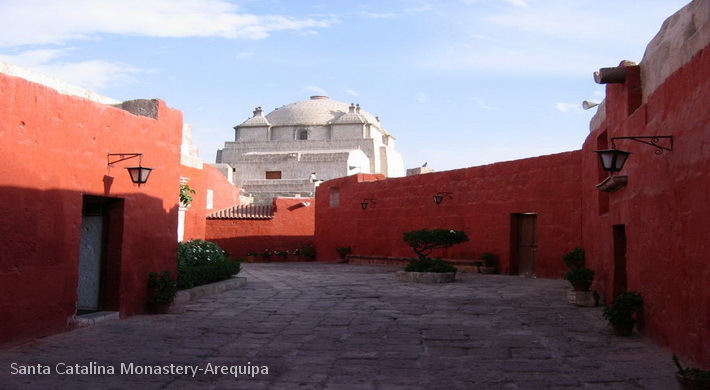 The Monasterio de Santa Catalina is the most astonishing site in Arequipa. It was founded in 1580 by a rich widow, Doña María de Guzmán. The Monasterio de Santa Catalina was opened to the public in 1970 after 400 years as a cloister. The convent has been beautifully refurbished with period furniture and paintings. Behind the closed doors the nuns, daughters of aristocrats, paid little heed to the vows of poverty and silence. Each had her own servant and dined with porcelain plates, fine tablecloths and silver cutlery. The convent is a complete miniature walled colonial town in the middle of the city. There are flower filled gardens, spacious patios, granite fountains as well as arches and narrow streets. The tile-roofed buildings are painted in traditional white, brown and blue. About 20 nuns still live in a section of the convent, which once housed up to 500. We will start the excursion with an escape to the past, walking through the Monastery Santa Catalina; which belongs to the most important attractions of Arequipa city, and keep behind their malls more them three centuries of history. We will continue the tour visiting Arequipa’s Main Square (Plaza de Armas), and the Compañia Church, famous for its incredible baroque style and its colorful Cupola of Saint Ignacio.